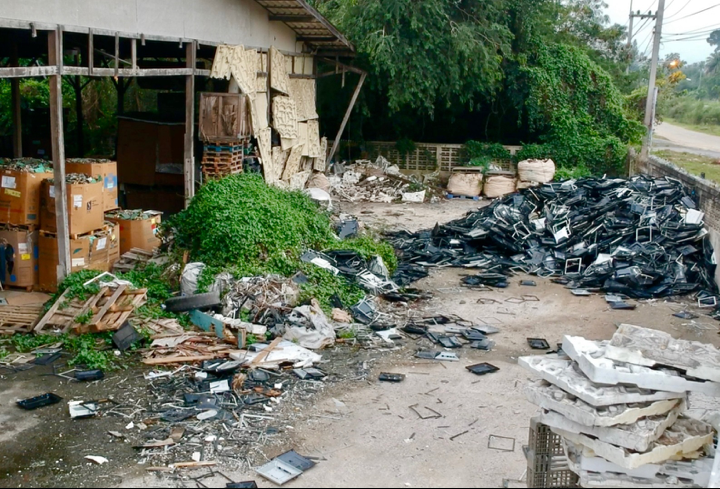 Waste Tourism: Is Thailand Becoming the New e-Waste Dumping Ground? May 24, 2018. Seattle, WA. For the last two decades, China was the world's primary e-waste dumping ground. Now, however, as China has closed down its polluting and dangerous backyard recycling facilities and cracked down on waste imports of all kinds, that distinction appears to have migrated to Thailand and perhaps other Southeast Asia and South Asian nations. 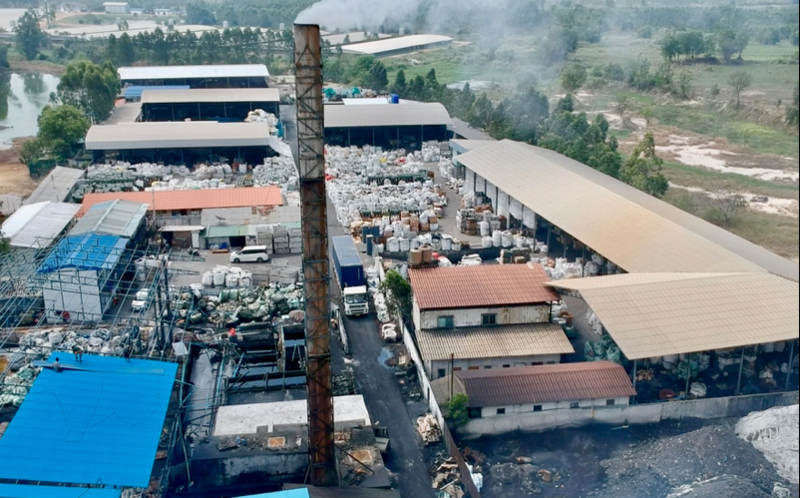 A highly polluting e-waste recycling operation, owned and operated by Chinese businessmen, using Burmese and Laotian labor, has been raided this week by the Thai Government. This dramatic event has prompted the toxic trade watchdog organization, Basel Action Network (BAN) to release additional findings to authorities of at least three other sites revealed to them either by whistleblowers or by following GPS tracking devices as part of BAN's e-Trash Transparency Project. China's actions to first close down what for decades was the sprawling center of global e-waste dumping in the township of Guiyu, in 2015, followed by their "Green Fence", and even more strict "National Sword" anti-waste trade and smuggling policies, appear to have resulted in a migration of the dirty e-waste recycling industry to Southeast Asia. BAN warns that we may be witnessing the first signs of what could very well turn out to be a Tsunami of mostly American waste being deflected from China to new landfalls in Southeast and South Asia. "Thailand must be applauded for being proactive," said Jim Puckett, Director of BAN. "Unless Asian countries quickly and effectively apply the same border controls and enforcement as China, they can expect to be the target of illegal and highly polluting shipments of electronic and other wastes." 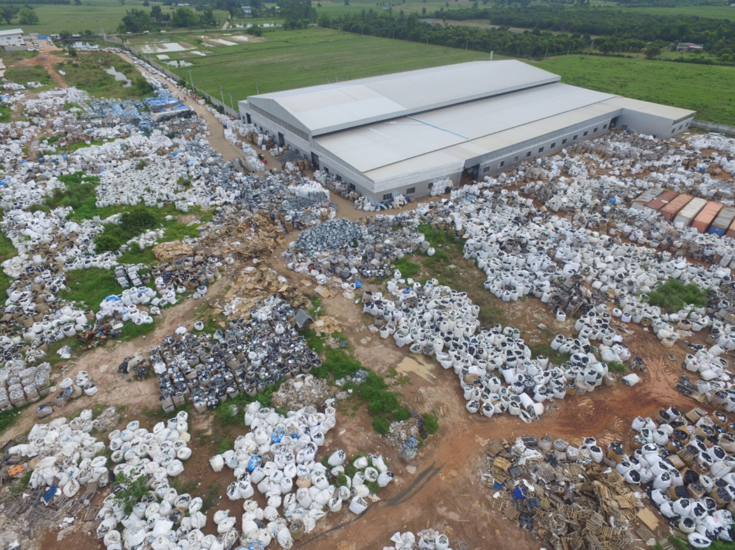 As reported in the Thai press, on Tuesday, the Thai national government conducted a raid on the massive Wai Mei Dat e-waste recycling facility in the Chachoengsao's Plaeng Yao district about 100 km. east of Bangkok. The Wai Mei Dat company is a large Chinese company with facilities in Chino, California, Thailand, Laos, and offices in Hong Kong. Wai Mei Dat is a registered member of the Institute for Scrap Recycling Industries (ISRI), and in Hong Kong is a certified R2 (Responsible Recycling) company. The raid was ordered at a very high level by Deputy Prime Minister General Prawit Wongsuwan and conducted by the Royal Thai Police as a joint operation of five concerned ministries: Natural Resources and Environment, Public Health, Industry, Justice and the Ministry of Finance. Wastes were found scattered out in the open air and workers were found to be undocumented citizens of Laos and Myanmar, making wages of about $280 US dollars per month. The workers were reported to be untrained and unprepared to be exposed to toxic shredder dust as well as the toxic fumes from hand cooking of electronics circuit boards. The company was charged with illegal importation of dangerous waste under false customs declarations. Drone shot of Wai Mei Dat grounds sprawling with imported e-Wastes in Super Sacks. Photo Copyright The Nation, Thailand Portal. May 22, 2018. 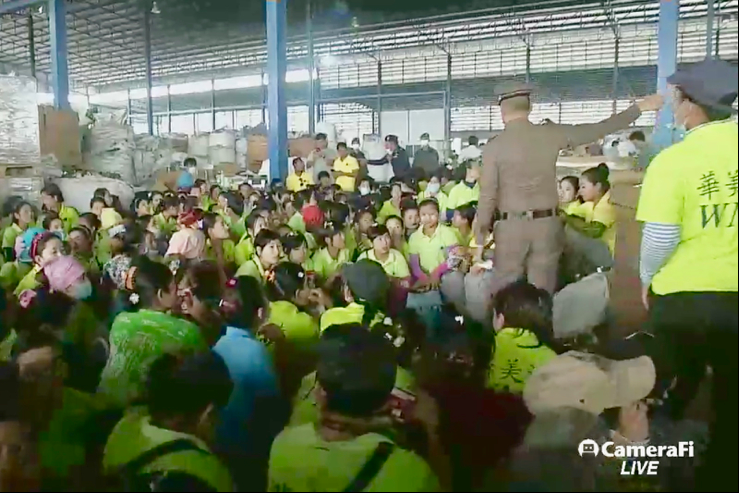 Undocumented workers rounded up by Royal Thai police at Wai Mei Dat. Clip from raid video produced by CameraFi, Thailand. May 22, 2018. Copyright CameraFi. BAN Finds Hidden "Dioxin Factory"
As a result of the Wai Mei Dat raid and the Thai enforcement action, BAN has decided to release further information of sites they have been investigating likely to be similarly operating illegally. Following up on a whistleblower tip, BAN visited a rural site 130 km. Northeast of Bangkok on February 2, 2018. This site, also run by an unnamed Chinese business and employing laborers from Myanmar, was a very large but dangerously primitive and polluting facility. The site is involved in breaking down computers in the back, shredding such equipment in the front of the plant and melting circuit boards and other copper-bearing material both by hand and by throwing the components into a large smelter in the heart of the facility. The smelter had no pollution controls whatsoever and thus the smoke belching out of the stack and the fugitive emissions are assuredly laden with highly toxic heavy metals, dioxins, furans, and polycyclic aromatic hydrocarbons. This smoke and ash fell out over workers and over cattle grazing fields, likely contaminating the local milk and meat supply. Drone view of "dioxin factory" where circuit boards and wires are burned in a giant smelter. Toxic smoke belches from the stack, while ash piles are visible in foreground, and imported electronic equipment seen in the background. Copyright BAN, February 2, 2018. Yian Hai Electric Co. Ltd. -- yet another Chinese owned facility in the Sriracha area near the Port of Laem Chabang, was discovered by GPS Trackers employed in Europe as part of BAN's e-Trash Transparency Project. There, Myanmar nationals were found living onsite in squalid, unsanitary conditions and living in shacks made from cardboard "Gaylord" boxes and Styrofoam. The workers' jobs were to break down mercury-bearing imported LCD screens and lead-laden CRTs to be further processed elsewhere. The better LCD screens were sent onward to the company's nicer plant employing Thai citizens in the port of Laem Chabang. In that plant the mercury lamps were replaced with strips of LEDs which is worthy re-use; however, the mercury-bearing tubes were simply thrown away with the local municipal solid waste creating an environmental hazard. Yian Hai Electric Co. Ltd. site near Sriracha, Thailand. BAN discovered this site by installing a tracker inside electronic equipment and deploying it in Europe. Working conditions here were very poor with workers living onsite in cardboard shacks. Copyright BAN, February 2, 2018. BAN has sent the coordinates of the new sites (above) and a third Chinese owned, Thai e-waste dismantling facility to Thai authorities so they can conduct similar enforcement actions against illegal imports and polluting activities, as the one conducted at Wai Mei Dat. In addition to calling on Asian countries to adopt the same strict controls of China, BAN also calls today for governments of the region to ratify the Basel Ban Amendment. This landmark agreement passed in 1995, but still needing the requisite ratifications to enter into legal force, prohibits the export of all forms of hazardous wastes from developed to developing countries. It is but three countries away from entering into force. Meanwhile, Thailand, Vietnam, Philippines, Cambodia, Myanmar, and Laos in the region have all yet to ratify the Amendment. China, Indonesia, and Malaysia, on the other hand, have ratified. "Sadly, most of this toxic electronic junk comes from unscrupulous recyclers in the US -- a country that is not even a Basel Convention Party," said Puckett. "But by ratifying the Ban Amendment, countries like Thailand can send a strong global message that will be impossible for the US or other countries to ignore and that is...Don't Dump on Us!" Founded in 1997, the Basel Action Network is a 501(c)3 charitable organization of the United States, based in Seattle, WA. BAN is the world's only organization focused on confronting the global environmental justice and economic inefficiency of toxic trade and its devastating impacts. Today, BAN serves as the information clearinghouse on the subject of waste trade for journalists, academics, and the general public. Through its investigations, BAN uncovered the tragedy of hazardous electronic waste dumping in developing countries. For more information, see www.BAN.org or blog.BAN.org.